The Westport Leaving Certificate classes of 1988 recently held a very enjoyable 25th school reunion. Thanks to everyone who helped to organise the night and especially to the Clew Bay Hotel for their wonderful hospitality, Amanda Burns for a great disco and to everyone who attended. We remembered our dear friend Neasa Duffy on the night. 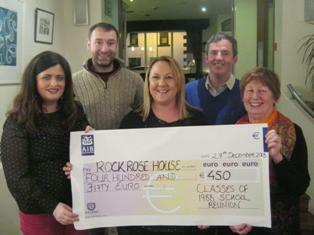 Neasa was co founder of the Mayo Cancer Support Association/Rock Rose House and we collected €450 in her memory. A cheque was presented to her mother Ann Duffy who is actively involved in the association. The presentation was made by Mary Slattery, Darren Madden, Mary Moore and Michael Mulchrone.